For the past 21 years, Cathy has owned a Private Residence in Humewood. 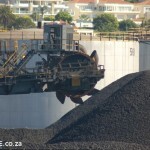 Cathy estimates the additional monthly maintenance and cleaning costs on this asset, as the result of the manganese ore, to be in the region of R500.00 per month. The cost of accelerated wear and tear over the life of Cathy’s asset is estimated to be: R3000.00. See other comments here: Manganese ore – Just Say No.